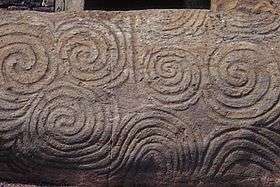 Ireland has the largest concentration of megalithic art in Europe, particularly in the Boyne Valley. This art form appears to be entirely abstract and is perhaps the most famous with its well known multiple-spirals. It is believed that much of this artwork is entoptically derived from induced states of altered consciousness (Dronfield 1993). Stylistically the art of Ireland is similar to occasional finds in nearby Wales and the Scottish Isles. The French region of Brittany has the second highest concentration of megalithic art. The earliest examples in this area are with anthropomorphic representations on menhirs which later continued in passage graves. Brittany shares some motifs with both Ireland and Iberia and the level of contact between them has always been debated. Among the most famous examples are the passage grave at Gavrinis and the Barnenez mound. Iberian megalithic art contains the most number of realistic representations of objects, although there is also a strong abstract element. Iberia is the only place to have painted decoration as well as carved. Other areas may also have originally been painted, but Iberia's arid climate lends itself to preservation of the paint.The paint (as it currently survives) is normally restricted to black and red, although occasionally features white as well. Megalithic art is extremely rare in Central Europe. The gallery grave at Züschen in Germany is an intriguing exception, as it appears to mix motifs known from the west European megalithic tradition with others more familiar from alpine Rock art. As well as abstract or geometric art, some carvings are considered to represent tools, weapons, animals, human figures, deities or idols. The gallery graves of the Seine-Oise-Marne culture such as that at Courjeonnet have images of axes, breasts and necklaces carved on their walls. The meaning of some of these is disputed. For instance, some of the tombs in the valley of the Petit Morin in France and elsewhere contain engravings of breasts, noses, hair, and a collar or necklace. These have been described both as deities (occasionally as 'dolmen deities') and as representations of the deceased. ↑ Peet, T. Eric (2006) [originally published 1912]. Rough Stone Monuments And Their Builders (PDF). The Echo Library. p. 81. ISBN 978-1-4068-2203-8.